Kick Off Summer on Healthy Kids Day! Saturday, April 27 10am-1pm at the Y! This event is FREE and open to the public. 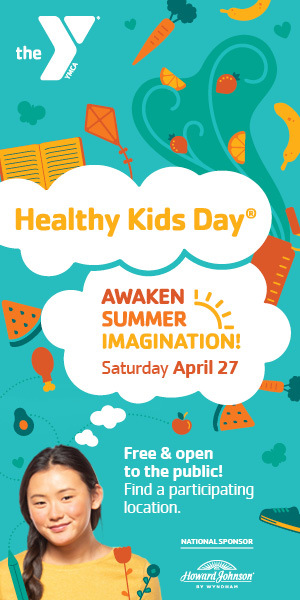 Our Healthy Kids Day event includes: A cool Moon Bounce and Obstacle Course; Kids Zumba; Kids POUND; Kids Fit; Healthy Snacks; Local Medical Professionals and Vendors; Games; Arts & Crafts; and so much more! In this clinic, athletes will learn the basics of game play, improve skills and have fun. Participants should supply their own cleats and shin guards. We will supply the ball. Class day, time and fees are provided in our Program Guide. The Guide is displayed on the Home Page of our web site. Learn the proper technique for shooting a bow and arrow, as well as, basic bow maintenance. Equipment provided. Our Program Guide shares the days, times and fees for this great program. A beginner class for our young archers. Learn all the basics on equipment geared towards this age group. Check out our Program Guide for class schedule and fees. This class creates a fun and supportive environment for kids to learn the basics of creating improv. The class is taught primarily through games, playk and improvised stories. Learn how to be positive, take risks, be more creative, overcome shyness and focus on the people you’re working with. Our Program Guide lists the class day and time. Kids will learn the basics of acting and storytelling through up-on-you-feet ensemble exercises, games and improvisations that activate their actor tools. This will help to develop speaking skills, build confidence and enhance early social skills and creative learning. Our Program Guide shares class days and times. An arts and crafts class involving different projects every week. Refer to our Program Guide for class days and times. An arts and crafts class for children who want to take part in arts and crafts but aren’t old enough for our other class. Each week will be a new age-appropriate craft. Check out our Program Guide for class days and times. This program is for those who are not quite old enough for some of our school age kid programs. A 30 minute class with story and activity time. See our Program Guide for days and times. 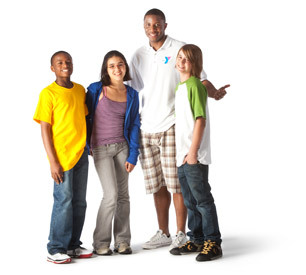 Our Youth Wellness Orientation Bracelet Program is designed for youth members ages 10-13 who would like to use our Wellness Center while their parent is in the room. Youth will be given FREE trainings with one of our Wellness Coaches to learn about each aspect of the Wellness Center. Youth members will learn proper technique, safety and etiquette of gym fitness. Schedule your appointment today at the Member Welcome Center. Youth members 10-13 years of age are permitted to exercise on the cardiovascular equipment with a parent after completing a free orientation with a Wellness Coach. The youth member must wear a yellow wristband when working out in the Branch. Youth members 12-13 years of age are permitted to exercise on the strength equipment with a parent after completing a free orientation with a Wellness Coach. The youth member must wear a blue wristband when working out in the Branch. Prerequisite: Must have completed yellow bracelet training. For more information: Please speak with our Member Service Team or Wellness Director. An instructed creative art class focusing on the exploration of different media and techniques. Open to all skill levels. Multiple forms of art media will be explored, paint clay, pencil and watercolor to name a few. Look at our Program Guide for class days and times. Participants and their parents will learn soccer skills through age appropriate games and drills. Participants will receive a size 3 soccer ball. Parents participation is required. Class days, times and fees are listed in our Program Guide. Our specialty parties are designed to make your child’s party the BEST EVER! We offer party packages to fit everyone’s needs. Our parties provide you with an hour of a specialty activity and an hour in our party room. A host can be provided for an extra fee to help make your party run smoothly. Parties offered on Saturday and Sundays. Please contact the Y for more details.